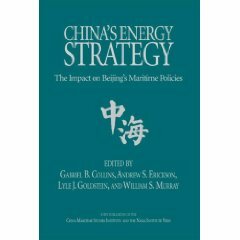 Gregory P. Gilbert, “Chinese Naval Shipbuilding: Ambitious, Uncertain”; review of Andrew S. Erickson, ed., Chinese Naval Shipbuilding: An Ambitious and Uncertain Course (Annapolis, MD: Naval Institute Press, 2016); prepared originally for International Journal of Maritime History, published online via the Australian Naval Institute, 23 September 2017. TRYING to predict the future is always ambitious and uncertain, however a thorough assessment of current indicators and physical outcomes does help to establish the direction and to set the limits of likely alternative futures. Today, as Ronald O’Rourke has suggested, the unipolar moment has ended and it is time we consider the best course of action necessary to promote peace in our multipolar world. ‘Chinese Naval Shipbuilding’ offers a rare glimpse into the industry that underpins the rise of the People’s Liberation Army Navy (PLAN). As such it is an important indicator of a possible cooperative or combative maritime future. 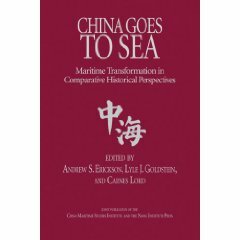 ‘Chinese Naval Shipbuilding’ is the sixth volume in the China Maritime Studies Institute and the United States Naval Institute series, Studies in Chinese Maritime Development, and like its predecessors this book is an authoritative work of international scholarship. 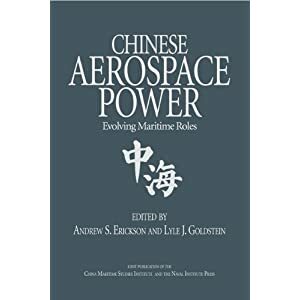 It is an edited collection of chapters written by some of the world’s leading China experts that systematically cover the significant features of China’s military shipbuilding industry. In an environment where much of the Chinese naval effort lacks transparency this book delves down into the nuts and bolts of China’s shipbuilding industry to explore trends and to analyse outcomes that truly reflect that nation’s current and future capabilities. The book is set out in five parts – Foundation and Resources, Shipyard Infrastructure, Naval Architecture and Design, Remaining Shipbuilding Challenges, and Conclusions and Alternative Futures. Although it is not possible to describe each of the 18 chapters in any detail, within this review, it is worthwhile mentioning a few of particular interest. 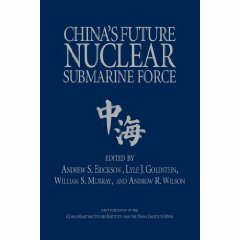 Be assured, however, that although each chapter is itself a treasure trove of information and analysis that providing great insight into its own particular subject, the collective synthesis ‘this book fills a key gap in our understanding of China, its shipbuilding, its navy, and what it all means’. (Erickson, p. 3). China’s naval objectives were clearly stated by the Chinese Communist Party (CCP) leadership when it released its ‘New Historic Missions’ in 2004. ‘Of the four missions, two were unprecedented: safeguard China’s interests and development, and contribute to international security’ (Christopher P. Carlson and Jack Bianchi, p. 23). This policy of ‘Near Seas Defence, Far Seas Operations’ has set the agenda for PLAN capability development for more than ten years and remains the major driver for the PLAN’s future plans. New initiatives, such as the ‘Maritime Silk Road’, substantially fit within the broader aspects of this policy. The successful implementation of plans to meet the ‘Near Seas Defence, Far Seas Operations’ agenda over the last twelve or so years confirms that the stated objectives are not just statements but have and are being achieved on a remarkable and seemingly ever increasing trajectory. While the total quantity of PLAN vessels has increased by over 40 percent between 2005 and 2016, (see Exhibit 0-2), the quality of China’s naval vessels has also increased dramatically. The ‘large fleet of legacy frigates and destroyers with limited utility beyond coastal waters and based on obsolete Soviet designs or concepts is well on its wat to being replaced with a new fleet of larger ships with better endurance, sensors, and armaments.’ (Alex Pape and Tate Nurkin, p. 121). China’s commercial shipbuilding output increased thirteen-fold between 2002 and 2012 and subsequently the CCP’s aim of China becoming the world’s leading commercial shipbuilder was met even before its target of 2015, however this industrial success story does not directly equate to parallel increases in naval shipbuilding capacity. Indeed, as a number of scholars have noted there are significant differences between merchant and naval shipbuilding activities (Sue Hall and Audrye Wong, esp. pp. 101-2). Also it is very difficult to accurately assess China’s naval shipbuilding capacity due its lack of transparency. China’s commercial shipbuilding success has been largely based upon large, non-complex commercial vessels, where hull, structure and steel production are paramount, success in naval shipbuilding involves smaller, highly complex designs with a much greater emphasis on weapons and sensors, propulsion and auxiliary systems. The evidence suggests that whereas China currently has numerous gaps in its naval shipbuilding industry, it is rapidly adapting to new and emerging technologies and adopting naval standards that will encourage continuous improvement in areas such as research, design, system and component production, quality, survivability as well as related fighting capabilities. ‘Chinese Naval Shipbuilding’ provides solid evidence that the PLAN is set to become the World’s second largest navy by 2020 and could well be on par with the US Navy by 2030. The US response to the rise of the PLAN in the next five to fifteen years may be largely negative or positive. The negative approach would be akin to the British desire to use a window of opportunity in 1914 to destroy the German navy before that nation could enact its longer term plans to expand into a powerful rival seapower by the early 1920s. The more positive approach would be akin to the cooperative approaches that promoted the powerful Anglo-American naval engagement between 1917 and 1945 – a time where British maritime supremacy was transitioned into US maritime supremacy by cooperative engagement instead of open conflict. ‘Chinese Naval Shipbuilding’ is highly recommended for everyone who wants to better understand our future multipolar world. Although factually dense and at times decidedly academic this book helps to fill the knowledge gap that informs fact based commentary on China. If you don’t believe you need to better understand the future importance of shipbuilding in China, then you will be sure to witness a major strategic surprise over the next few years. ‘Chinese Naval Shipbuilding’ is healthy food for the brain. This book review was originally prepared for the ‘International Journal of Maritime History’ (IJMH) and is reprinted here with permission from the IJMH. —M. C. Huitron, 5-Star Review, Amazon.com, 2 August 2017. —Amazon Customer, 4-Star Review, Amazon.com, 19 July 2017. —Survival: Global Politics and Strategy 59.4 (August–September 2017): e4. —Khurram Shahzadon, 4-Star Review, Amazon.com, 27 June 2017.